If you don’t recall or don’t know what Verbesina virginica looks like when it’s fresh, you may want to take a quick look back at a picture from this summer. As for the origin of the vernacular name frostweed, let me repeat what I wrote at the end of November last year. The common name for this species comes from one of the strangest phenomena in botany. By the time the frost begins settling overnight on the lands where frostweed grows, almost all of these plants have gone to seed. Although each stalk stands there unappealingly as it dries out, the first good freeze can cause it to draw underground water up into its base. Now for the strange trick: the exterior of the part of the stalk near the ground splits open as it extrudes freezing water laterally, and that process produces thin sheets of ice that curl and fold around the broken stalk and sometimes even unscroll away from it (you can see that unscrolling in a photograph from last year). I took this picture of the fabled frostweed phenomenon yesterday morning in Great Hills Park. The sun had already been climbing for a couple of hours, and as its light reached the frostweed and the temperature rose, the ice began to melt. 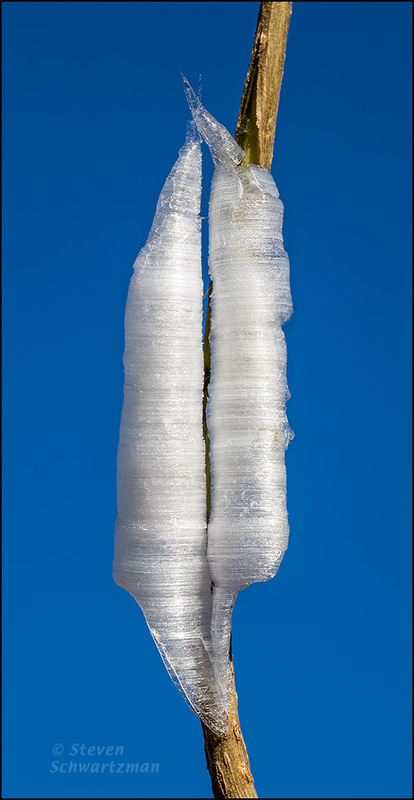 You can see that the narrow cone of ice that formed the right-hand peak of this formation had come loose from the frostweed stalk and was leaning far enough over that it would soon fall off. The whole left side of the ice already looks partially detached from the stalk as well. In the mild climate of Austin, frostweed ice rarely makes it through the morning, and yesterday was no exception. To see the many places in the southeastern third of the United States where Verbesina virginica grows, you can consult the state-clickable map at the USDA website. I don’t think we have this sort of plant over here! I feel the same way you do about the phenomenon. Unless this American species has been transplanted to Europe, you’re correct that you don’t have it over there. Hooray! One of my favorite harbingers of winter, and one I’ve never seen here on the coast. Now I know why. According to the map, Galveston and Chambers counties are out of the frostweed loop. This is quite different from most I’ve seen, where the extrusions are more loopy and ribbony. This reminds me of the scrolls of the Torah. Here’s a question that just occurred to me. Last year, my Hill Country friends searched and searched for frostweed “blooms” and never found a single one. We assumed it was a temperature thing, or just bad luck. Now, I wonder if the drought played a role, too, with less water available for putting on the show. I’m just so happy to see this. Thanks for being out there “on the hunt” for us! I gave an inner hooray, too, when went to the nearest place where I know frostweed grows, looked down the embankment, and saw some tell-tale patches of white a hundred feet away. My outdoor home thermometer had read 36°, so I wasn’t sure there’d be any frostweed ice, but happily there was. I’ve seen photographs where the extrusions are more ribbony and loopy, as you said, but for whatever reason, the parallel scrolls shown here (which might coincidentally be saying Happy Hannukah) are the configuration that’s by far the most common one I encounter in Austin. My Great Hills neighborhood in Austin is one mile west of the eastern boundary of the Texas Hill Country, which I’m therefore a resident of. We had frostweed ice here in 2011, despite the drought, so I don’t know why your friends farther west in the Hill Country wouldn’t have had it too. Perhaps your friends were just unlucky, as you speculated, and didn’t come across any plants that were doing their thing. Or maybe conditions were different enough there compared to Austin that the phenomenon didn’t happen. I’m certainly glad to have seen it several years in a row here. It’s astonishingly seductive–giving new meaning to playing with nature and human nature. It reminds me of silken cocoons–spinning of webs and the like. Thanks for another look at a fascinating touch by nature. You’re welcome, Sally. You’re the first person I’ve heard call this ice phenomenon seductive, but I like that description. As often as I’ve photographed spiderwebs and spider silk, somehow I’d never conceived frostweed ice as having been spun, whether by a spider or caterpillar. Once again your imagination has gone beyond mine; good for you. Yes, and it means I have to go out and brave the cold again. Actually I kept busy yesterday morning and didn’t feel cold, which surprised me. Mathilda says that this is frostily beautiful and unique. I agree. So beautiful and unusual and even the flowers looked lovely in their turn. You’re right, of course, and yet this is one of the many wildflowers to which people have given a name with weed in it. The endless wonders of the natural world, nice catch. Some of those wonders are seasonal (and in this case more narrowly confined to early cold weather). They give us something to look forward to when the season comes around again each year. I am always amazed at the way temperature can affect water. Especially the cold. Frozen water fonts with icicles running down the sides. Red clay that extrudes the water up into frozen pyres, that lifting stones and pebbles out of the ground seem as little offerings to the cold morning. Recently, having left the hose out on a freezing night, I discovered that you can watch the freezing process if the trickle is slow enough (a frozen hose will do that for you). Holding the hose into the water bucket I watched in fascination as flat planes of ice crystal began to form and swirl under the water. Like this + but, if you can imagine it, they grew out in all six directions at once! I haven’t seen most of the things you describe, but they sound like good opportunities for some camera work on your part, especially as you have several months of winter ahead of you. I jump at the chance to photograph frostweed at this time of year because in Austin we rarely get much ice for photographers to play with. For example, although the temperature was around freezing this morning and there was a second round of frostweed ice, the temperature as I’m writing to you at noon is 53°. Are you saying that the frostweed produced ice when it was 53 deg.? That’s an excellent science video; thanks for bringing it to our attention. I mentioned the 53° to show you how the day warms up here. When I left this morning’s frostweed plants at around 11 o’clock, most of the ice had already melted, even though it was still in the shade. Looks like WordPress converted the YouTube link. I’ve seen that happen before. John Locke tells a story of the British ambassador at the court of the king of Siam (southern Asia) whom he told about water: if it gets very cold it becomes so hard that you can walk on it. The king’s response was: Ambassador, I believed all things you told me about your country, because you seem to be an honest and reasonable man, but after hearing this I have to declare You a shameless liar, Ambassador! Good for you that you get to play with ice for months on end. I take the little I can get, as we rarely have ice (or snow) in Austin. Thanks for correcting my anecdote, today the Dutch ambassador (neither the British) wouldn’t be so sure about the elephant. Only last winter, strongest in more than a decade, had their canals frozen again. Last winter was extremely strong in Poland, too, my roses were frozen. I made many photos of ice-shapes, and even gave them a genre-name: lodoplastyka. I’m sorry, but somehow WordPress put your comments in the spam folder, something that has happened to other people from time to time. I discovered it only today. How nice of you to have given a name to ice shapes. I wish I had more opportunities to photograph them. You are one awesome photographer, Steve! Love your stuff. Thanks so much, Joan. What I find in nature inspires me. Yet another remarkable photograph from you, and the story behind it is equally remarkable. Thanks, Susan. This phenomenon really is remarkable. I went back for another round of pictures this morning after the overnight temperature got down to freezing. That’s beautiful and fascinating both! I had never heard of it. I lived in Austin for a quarter of a century before I heard of it, and some years more before I finally saw it. Kids in school here should learn about it. Now that photo really stirred up some people. My weed did not do that when it froze the other night. Still had lots of green leaves on the plants. I have oodles of frostweed. I grow for the bees and the butterflies. Have photos posted on my blog with queens and some bees. This plant is so easy to grow. In fact it was on our property when my husband and I married. I leave stands of it in some places and have even moved some of it around. It is a great perennial and readily re-seeds. This is a native that people should try to grow since it really attracts butterflies where I live. I’m not sure of the soil needs but the soil here is black and crumbly with caliche 8-12 inches down in some places. Yes, it has proved to be a popular photo. As for the frostweed, I noticed yesterday that some of the plants with ice on them here also still had leaves, which surprised me, because that isn’t usually the case (or maybe I was so excited to be able to photograph the ice in years past that I wasn’t as observant then as I should have been. I’m glad you have oodles of frostweed on your property, and of long standing. And speaking of standing, the fact that frostweed can grow to 10 ft. tall may be one reason some people think of it as weedy. I’m not one of those people. What a pity that your readers who are unfamiliar with frostweed should see only this form of the phenomenon, however interesting! Even if their technical quality is not up to your current capabilities, do please show them the glory of your “frostweed ice” series. It overpowers the heart. Thanks for the vote of confidence. I did something along the lines you suggest (but without going as far back as you’d probably like) by including the second link in the text above, which takes viewers back to a different sort of frostweed ice picture from last year. In general on this blog I’ve shown older photos of something only if I don’t have something relatively recent, though there have been a few exceptions. You say that the “first touch of hard frost can cause it to draw underground water up into its base”, but are you SURE that what’s already there isn’t just forced out by the natural expansion as water is transformed into the solid state? Thanks for the link. I’m glad some other people in our area appreciate these “frost flowers,” which many residents are unaware of. Even a lot of people here haven’t heard of this, so it’s not surprising that you haven’t. I’m glad you like the way the photograph captures the moment. Such a fascinating phenomenon, Steve. It is, and I’ve been fortunate to see it once or twice every winter since 2011, the year I began this blog.